Canon announced two new photo printer today. One of them is called Canon SELPHY CP780 (you read about the other Canon SELPHY CP790 here) and can print post card sized pictures in 47 seconds. The CP780 photo printer will be available in pink, blue, silver or white colors. The software that comes with the Canon SELPHY CP780 can be used with both Windows and Mac computers. Amstelveen, The Netherlands, 10 June 2009 : Canon today refreshes its SELPHY compact photo printer line-up with the launch of the SELPHY CP780. Replacing the SELPHY CP760, the new ultra-compact printer significantly improves on the printing speeds of its predecessor. Designed for fun, affordable family printing, it provides a user-friendly way to produce superb, lab-quality photo prints in under a minute. Available in pink, blue, silver or white – the SELPHY CP780 also offers fully portable printing with an optional battery pack. For ultimate ease of use, the SELPHY CP780 incorporates a user-friendly interface, plus large buttons with a straightforward layout – allowing anyone to start making prints effortlessly. The large 2.5” TFT colour LCD screen offers detailed image preview when printing straight from memory card, with easy-to-understand instructions and menu support for 7 languages. The SELPHY CP780 incorporates three memory card slots. These allow direct, computer-free printing from a wide variety of popular memory cards*. PictBridge compatibility means users can also print directly from most models of digital camera. With an optional Bluetooth adaptor, prints can be made from mobile phones and other wireless devices. 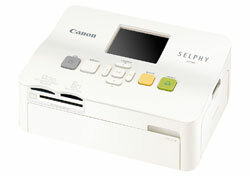 The SELPHY CP780 includes updated, easy-to-use software – SELPHY Photo Print – which now includes audio guidance, so when users are printing from a computer a voice provides spoken instructions. This is particularly ideal for children, or those new to printing. In as little as 47 seconds**, the SELPHY CP780 prints to a variety of different sized media, including standard postcard size or wide photo prints, credit cards or miniature stickers. Plus, with its fast boot-up, there’s no waiting around for the printer to warm up – so your photos are in your hand in seconds. Dye sublimation technology delivers smooth, glossy results, giving finished prints the quality, look and feel of traditional lab prints. A special over-coating covers the prints to protect them from spills and splashes. Prints will retain their quality for up to 100 years*** when stored in an album. The SELPHY CP780’s range of clever image enhancement technologies ensures photos look their best – features such as Auto Image Correction and Auto Red-Eye Correction automatically optimising every image. As well as being affordable in their own right, SELPHY printers give you complete control over the cost of your photo printing. SELPHY cartridges contain paper and ink for an exact, pre-defined number of prints, so every single print has a predetermined cost. Waste can be further reduced by previewing images before printing on the LCD screen of your camera or printer – ensuring that you only print the images you want. Ink cartridge is included with media. The SELPHY CP780 is supplied with SELPHY Photo Print software, which includes step-by-step audio guidance on how to print images. This is ideal for users who are inexperienced with computers, printers or both – and provides a great way for children to learn how to print. CANON iMAGE GATEWAY****: 100MB of online ‘personal gallery’ space for sharing stills and video with family and friends. SELPHY printers use a dye-sublimation printing process to produce high-quality prints with the look and feel of photos from the lab. This process is particularly suitable for photo printing because it transfers colour into the structure of the paper rather than printing onto the surface. Light reflects evenly off the print for a richer, glossier photo. And with a total reproduction range of more than 16.7 million colours, SELPHY printers deliver all the vibrancy and subtle tone gradations of professional, lab-produced prints. SELPHY printers produce rich, vivid prints that are fade and moisture resistant for up to 100 years***. A durable, protective coating is applied at the end of the printing process to guard against splashes, spills and sticky fingers. To prevent smudging and fingerprint marks, photos are dry to the touch and ready to handle the moment printing finishes. *The following cards can be used without an adaptor: CompactFlash, Microdrive, SD, miniSD, SDHC, miniSDHC, MMC, MMCplus,HD MMCplus, MMCmobile, RS-MMC, Memory Stick, Memory Stick PRO, Memory Stick Duo, Memory Stick PRO Duo. ***100 year figure based on accelerated tests. For further information see specifications. ****CANON iMAGE GATEWAY is not available in all European countries. Please see www.cig.canon-europe.com for available countries. Movie upload requires users to download and install the movie upload task, available after registration from the CANON iMAGE GATEWAY site.